Post-traumatic stress disorder (PTSD) is not a mental disorder someone is born with. In order to possibly develop PTSD someone needs to experience or witness a traumatic event. A traumatic event can be anything, ranging from being bullied to sexual assault, and from a car accident to being threatened by someone on social media. Experiencing a traumatic event is one of the causes of PTSD. Fortunately, experiencing a traumatic event alone is not enough to develop PTSD. It is possible that two people experience the same car accident, but only one of them develops PTSD. It is likely that the person who develops post-traumatic stress disorder is more vulnerable to developing PTSD. So, what exactly are the causes of PTSD? There are two main factors contributing to the possible development of PTSD: environmental stressors and genetic vulnerability . We’ll discuss each of the causes of PTSD below, as well as the risk factors and protective factors that help prevent PTSD to develop after experiencing a traumatic event. At Barends Psychology Practice, we treat post-traumatic stress disorder online and in person. Book your first, free of charge, session now: contact us. (Depending on your health insurance, treatment may be reimbursed). What is Post-traumatic stress disorder. How to cope with PTSD? An environmental stressor could be anything someone experiences that is considered stressful. Some environmental stressors have a bigger impact on someone than other environmental stressors. And sometimes a stressor has a huge impact on person A, but not on person B. A difficult childbirth, for instance, can be traumatic to Mary, but a similar difficult childbirth may not be traumatic to Jane. There are several reasons why one traumatic experience can result in PTSD in Mary but not in Jane. We’ll discuss them in of the chapters below. Examples of environmental stressors are childbirth , working in stressful environments, such as rescue and recovery workers and military personnel ,, interpersonal violence, such as physical assault, sexual assault or emotional abuse ,, accidents, natural disasters, life threatening illnesses or injuries, murder, and extreme human suffering . 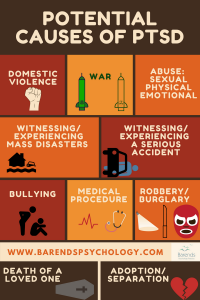 Some traumatic events, such as accidents, sexual assault, and murder, cause acute stress and other PTSD related symptoms, whereas for other traumatic events, such as emotional abuse, the PTSD related symptoms may only occur after a period of time, sometimes years later. In the latter, the abuse is less obvious and the damage done to the victim accumulates over time. 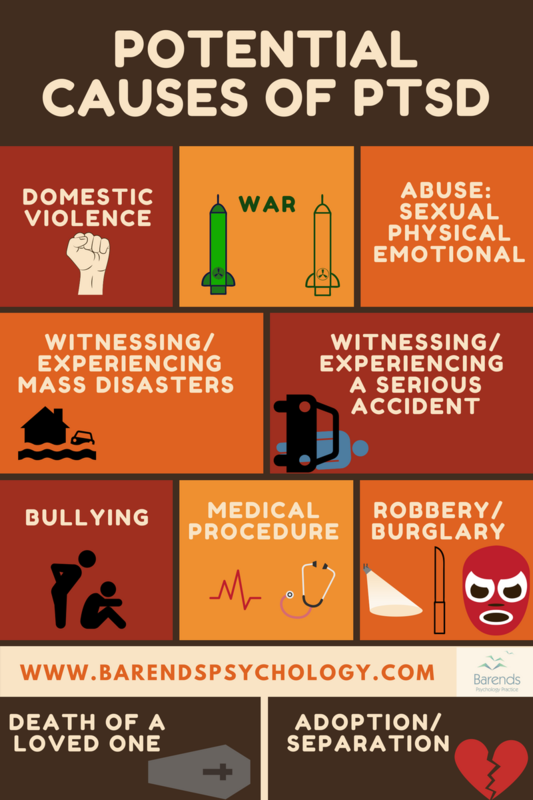 Often, one single emotionally abusive event does not cause enough PTSD symptoms to meet the criteria for PTSD, but something as shocking as accidents, murder, and sexual abuse, do cause a lot of PTSD related symptoms immediately. In other words: environmental stressors contribute to the development of post-traumatic stress disorder, and can be seen as one of the causes of PTSD. However, experiencing or witnessing a traumatic event alone is not enough to develop PTSD. There are other factors that affect the possible development of PTSD, such as genetics, risk factors, and protective facts. We’ll discuss these other protective factors and potential causes of PTSD below. Next to the environmental stressors, genetic factors contribute to the vulnerability of the development of PTSD, but also to the exposure of potentially traumatic events . The first finding may suggest that certain genes may have a negative impact on factors that protect someone from developing PTSD, and therefore make someone more vulnerable to the development of PTSD. It could also mean that certain genes have a negative influence on the way traumatic events are being processed in the brains. The latter finding may suggest that certain genes negatively impact risk assessment or encourage risk taking behaviour. It is possible that someone is more often exposed to potentially traumatic events if that person has poor risk assessment skills, but also if that person likes risky behaviours. Twin study estimates of PTSD heritability vary from 24 to 72% after a traumatic experience, and that women are two to three time as likely to develop PTSD ,,,. PTSD heritability estimates tells us that 24 to 72% of the variability in PTSD is due to differences in genes among people. This does not mean that 24 to 72% of the people develop PTSD after a experiencing or witnessing a traumatic event. It does tell us that 24 to 72% of the differences in genes among people contribute to the development of PTSD. Which risk factors contribute to the causes of PTSD? No risk factor directly causes PTSD, but there are a few risk factors that indirectly increase the chance of developing PTSD. One of the causes of PTSD are traumatic experiences someone faced early in life (since childhood). The amount and severity of traumatic experiences increase the chance that a future ´traumatic´ event may causes PTSD. Inherited mental health risks (depression or anxiety) might increase the chance that a future ´traumatic´ event causes PTSD. Inherited personality traits (think of temperament) may be one of the causes of PTSD development in the future. Having a job that brings you more often in the position of experiencing traumatic events (like soldiers). Lacking a good support system may increase the chance that a future traumatic event causes PTSD. Talking about your feelings and about what happened during the traumatic event helps your mind to process all the information. Especially for people who are being or have been bullied, this is especially essential. If people who are being bullied don’t have a good support system, the chances of them developing PTSD increase drastically. Factors that can protect someone from developing PTSD are good coping skills, optimal adaptation , high levels of preparedness ,, and social support ,. At the same time, minimal coping, low levels of preparedness, and poor social support increase the risk of developing PTSD. Troops who were well prepared before deployment perceived levels of threat that were correlated with levels of combat, whereas troops who were unprepared before employment perceived high levels of threat regardless combat exposure . Rescue and recovery workers who had previous experience or disaster training were less likely to develop PTSD . At the same time, workers who are longer exposed to the results of disasters or war, such as the World Trade Center disaster or the Vietnam war, are more likely to develop PTSD ,. This is in line with another study where police officers who experienced lower critical incident exposure less often developed PTSD . Having positive world assumptions is another protective factor; assumption such as ‘the world is a good place’ help prevent the development of post-traumatic stress disorder after witnessing or experiencing a traumatic event . Religious moral beliefs help protect against the development of PTSD and its symptoms as well . The higher the score on the moral beliefs index the lower the PTSD-symptoms score. Additionally, religious moral beliefs enables veterans to better control distress. Exploring one’s spiritual needs and desires after a traumatic event could help protect one from developing PTSD. Smoller, J. W. (2016). The genetics of stress-related disorders: PTSD, depression, and anxiety disorders. Neuropsychopharmacology, 41, 297. True, W. R., Rice, J., Eisen, S. A., Heath, A. C., Goldberg, J., Lyons, M. J., & Nowak, J. (1993). A twin study of genetic and environmental contributions to liability for posttraumatic stress symptoms. Archives of general psychiatry, 50, 257-264. Stein, M. B., Jang, K. L., Taylor, S., Vernon, P. A., & Livesley, W. J. (2002). Genetic and environmental influences on trauma exposure and posttraumatic stress disorder symptoms: a twin study. American Journal of Psychiatry, 159, 1675-1681. Maggioni, C., Margola, D., & Filippi, F. (2006). PTSD, risk factors, and expectations among women having a baby: a two-wave longitudinal study. Journal of Psychosomatic Obstetrics & Gynecology, 27, 81-90. Perrin, M. A., DiGrande, L., Wheeler, K., Thorpe, L., Farfel, M., & Brackbill, R. (2007). Differences in PTSD prevalence and associated risk factors among World Trade Center disaster rescue and recovery workers. American Journal of Psychiatry, 164, 1385-1394. Xue, C., Ge, Y., Tang, B., Liu, Y., Kang, P., Wang, M., & Zhang, L. (2015). A meta-analysis of risk factors for combat-related PTSD among military personnel and veterans. PloS one, 10. Kilpatrick, D. G., Ruggiero, K. J., Acierno, R., Saunders, B. E., Resnick, H. S., & Best, C. L. (2003). Violence and risk of PTSD, major depression, substance abuse/dependence, and comorbidity: results from the National Survey of Adolescents. Journal of consulting and clinical psychology, 71, 692. Spinhoven, P., Penninx, B. W., van Hemert, A. M., de Rooij, M., & Elzinga, B. M. (2014). Comorbidity of PTSD in anxiety and depressive disorders: prevalence and shared risk factors. Child abuse & neglect, 38, 1320-1330. Amstadter, A. B., Nugent, N. R., & Koenen, K. C. (2009). Genetics of PTSD: fear conditioning as a model for future research. Psychiatric annals, 39. Sartor, C. E., McCutcheon, V. V., Pommer, N. E., Nelson, E. C., Grant, J. D., Duncan, A. E., … & Heath, A. C. (2011). Common genetic and environmental contributions to post-traumatic stress disorder and alcohol dependence in young women. Psychological medicine, 41, 1497-1505. Wolf, E. J., Mitchell, K. S., Koenen, K. C., & Miller, M. W. (2014). Combat exposure severity as a moderator of genetic and environmental liability to post-traumatic stress disorder. Psychological Medicine, 44, 1499-1509. Agaibi, C. E., & Wilson, J. P. (2005). Trauma, PTSD, and resilience: a review of the literature. Trauma, Violence, & Abuse, 6, 195-216. Renshaw, K. D. (2011). An integrated model of risk and protective factors for post-deployment PTSD symptoms in OEF/OIF era combat veterans. Journal of Affective Disorders, 128, 321-326. Kline, A., Ciccone, D. S., Weiner, M., Interian, A., St. Hill, L., Falca-Dodson, M., … & Losonczy, M. (2013). Gender differences in the risk and protective factors associated with PTSD: a prospective study of National Guard troops deployed to Iraq. Psychiatry: interpersonal & biological processes, 76, 256-272. Yuan, C., Wang, Z., Inslicht, S. S., McCaslin, S. E., Metzler, T. J., Henn-Haase, C., … & Marmar, C. R. (2011). Protective factors for posttraumatic stress disorder symptoms in a prospective study of police officers. Psychiatry research, 188, 45-50. Hasanović, M., & Pajević, I. (2010). Religious moral beliefs as mental health protective factor of war veterans suffering from PTSD, depressiveness, anxiety, tobacco and alcohol abuse in comorbidity. Psychiatria Danubina, 22, 203-210.